And an agent of Lord became visible to him, standing on the right side of the altar of incense. And there appeared to him an angel of the Lord, standing at the right side of the altar of incense. 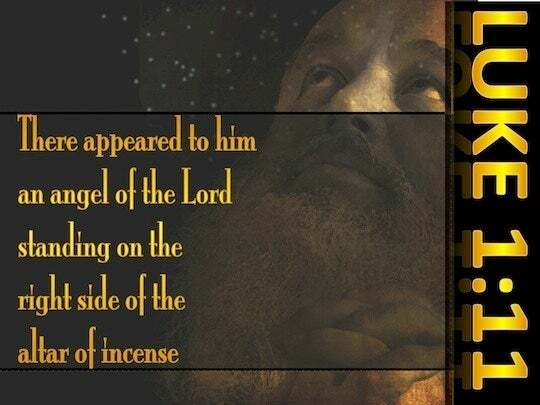 Just then an angel from the Lord appeared to him, standing at the right side of the incense altar. Then an angel of the Lord appeared to him, standing on the right side of the altar of incense. when there appear'd to him an angel of the Lord standing on the right side of the incense-altar. And an angel of the Lord appeared to him, standing on the right of the altar of incense. And an angel of the Lord appeared to him, standing at the right of the altar of incense. And a messenger of the Lord was seen to him, standing from the right of the altar of fumigation. And an angel of the Lord appeared to him, standing at the right side of the altar of incense. 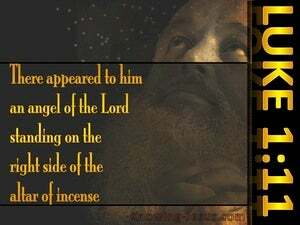 And an angel of the Lord appeared to him as he was standing on the right of the altar of incense. And there appeared unto him, an angel of the Lord, standing on the right side of the altar of incense. And an angel of the Lord appeared to him, standing on the right side of the altar of incense. Then there appeared to him an angel of the Lord, standing on the right side of the altar of incense. And there appeared to him an angel of the Lord, standing on the right of the altar of incense. 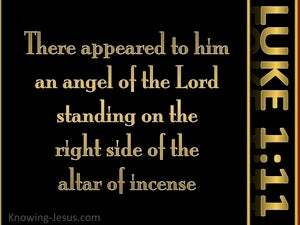 And an angel of the Lord appeared to him standing on the right side of the altar of incense. In the meantime, an angel of the Lord appeared to him, standing at the right of the altar of incense. 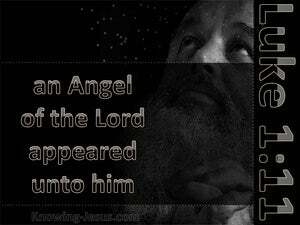 And there appeared to him an angel of the Lord standing on the right hand of the altar of incense. and he hath put the perfume on the fire before Jehovah, and the cloud of the perfume hath covered the mercy-seat which is on the testimony, and he dieth not. and a messenger of Jehovah appeareth unto the woman, and saith unto her, 'Lo, I pray thee, thou art barren, and hast not borne; when thou hast conceived, then thou hast borne a son. are they not all spirits of service -- for ministration being sent forth because of those about to inherit salvation?